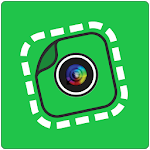 Toss out the scissors and let your Android camera do the clipping. 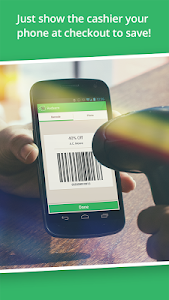 Simply snap a picture of any printed offer, and SnipSnap magically converts all the text, images and barcodes into a mobile-optimized offer, which you can redeem off your screen. 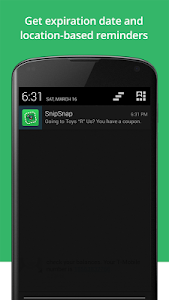 • IN-STORE REMINDERS: When you enter a store, SnipSnap delivers a push notification to remind you what coupons you have saved there. • FOLLOW FRIENDS: Connect to friends from your address book, Facebook, or Twitter accounts. Option to share your couponing activity to Facebook. • STORE SUCCESS RATING: See how successful other users have been in redeeming at your favorite stores. 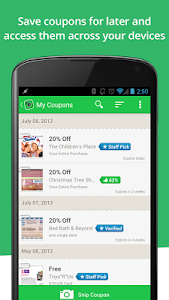 LOCATION REPORTING: SnipSnap gives you the option to be notified about coupons based on your location. This feature uses a method for reporting location changes in the background. Note that this is only invoked and reported upon a significant location change event -- e.g. moving between two cell towers. As a result it does not typically cause the battery to be drained (unless you are, say, driving all day in the car). Location reporting can be easily disabled via the "Location Notifications" toggle in the Settings screen. 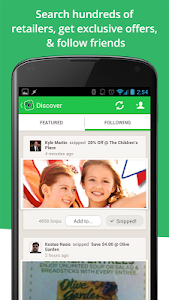 Similar to "SnipSnap Coupon App"